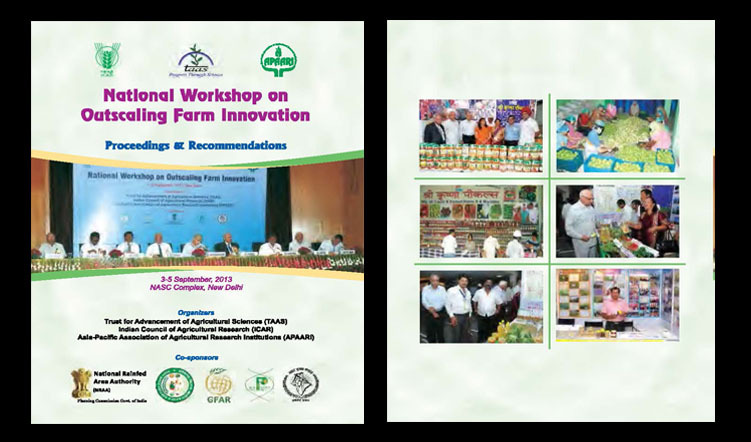 National Workshop on “Outscaling Farm Innovations” was jointly organized by Asia-Pacific Association of Agricultural Research Institutions (APAARI), Indian Council of Agricultural Research (ICAR), Trust for Advancement of Agricultural Sciences (TAAS), Haryana Kisan Ayog (HKA), Bharat Krishak Samaj (BKS), Protection of Plant Varieties & Farmers Right Authority (PPV&FRA), National Rainfed Area Authority (NRAA) and the National Innovation Foundation (NIF) on 3-5 September, 2013 at the National Agricultural Science Centre (NASC) Complex, Pusa Campus, New Delhi, India. A total of 267 participants comprising administrators, researchers, policy planners, innovative farmers, including women, CSOs (NGOs, Fos) and representatives of the farming communities as well as private sector in India and representative of Prolinova attended the workshop. There is an urgent need for a paradigm shift in AR4D to address the needs of small farmers and place renewed emphasis on “Farmer First” through participatory approach, better knowledge sharing and enabling policy environment to ensure food and nutritional security on a sustainable basis. Outscaling of innovations based on their techno – economic feasibility, relevance and utility would be the key for inclusive growth of small farmers. Hence, identification of such innovations like happy seeder, laser leveler, zero-till drill, paddy transplanter, conservation agriculture, protected agriculture, new varieties/hybrids, etc. and their faster adoption or use will benefit considerably the small holder farmers. Mission mode programmes on small farm mechanization, protected cultivation, low cost rural based agro-processing for value addition, livestock development, promotion of hybrid technology, micro-irrigation, etc. would go a long way in increasing both productivity and income of farmers. Hence, greater policy support for promotion of these innovations will be needed. Farmer led innovations relating to new crops, new areas, new on-farm/offfarm based secondary agriculture, etc. must be identified, tested, refined and advocated for large scale adoption for greater benefit to our farming community. Some examples are: rabi maize in Eastern India, spring maize in northern region, summer moong in rice – wheat cropping system, boro rice in West Bengal, direct seeded basmati rice, vegetable production in plastic tunnels, polyhouses, micro-irrigation, fertigation, organic farming, etc. Integrated farming systems involving high value crops and livestock should be developed and encouraged for different agro-ecosystems. This would help in increasing income of small farmers. Market reforms should be given high priority for promoting farmer-led innovations. 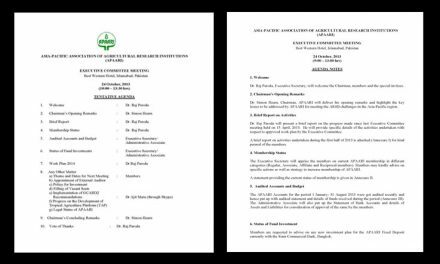 Revision of Agricultural Produce Marketing Committee (APMC) Act especially to delink horticultural produce (vegetables and fruits), provision of kisan bazars/ huts, cool chain and credit linked trade/marketing options, and linking farmers to markets will be required to benefit both farmers and consumers. Convergence and connectivity of different institutions and development programs for outscaling of innovations and development of necessary social skills is necessary. The innovations in use of renewable sources of energy, like bioenergy and solar energy should be improvised and outscaled by convergence of programs and activities of different government departments and private sector. Market innovations should ensure greater share of farmers in the transparency in price discovery, better delivery of quality inputs, flow of market information and risk management. For open access knowledge sharing, there is a need for more effective and rather efficient extension mechanisms like ICT, smart phones, radio and television (dedicated channel exclusively on agriculture). Creation of a cadre of young technology agents for custom hire services in specialized areas will help in reducing dissemination losses while out-scaling farm innovations. 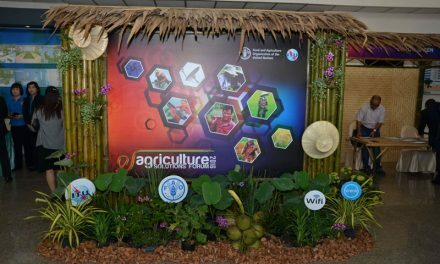 Incentives and rewards to innovative farmers will be needed to promote useful technologies on farmers’ fields. For this, central and state governments must create “Farm Innovation Fund” so as to ensure their sustained interest in creating and promoting new initiatives for enhanced productivity and income. Incentives and venture capital funds should also be provided to the entrepreneurs for upscaling and outscaling farm innovations and technologies, which need substantial investment in producing material (planting material, machine, seed, feed, etc.) for outscaling the innovations. There is an urgent need to have institutional reforms especially for better coordination, convergence and efficiency. Linkage between KVK and ATMA, linking schemes under MNREGA, RKVY, NFSM, etc. with outscaling of useful farm innovations, each KVK to act as an ATIC, promotion of self-help groups (SHGs), establishing co-operatives and farmers’ company, etc. will help in having greater impact of new innovations. Also, successful public-private-partnership models will have to be replicated by creating enabling policy environment. Innovative farmers, so identified must be rewarded and given incentives, as well as, recognition as “Farm Professors”, so as to share their knowledge and experience, while imparting training to others for much needed capacity development. Farmer to farmer training will have much greater acceptability and generate confidence for outscaling new innovations. Availability of credit at low interest rates and provision of insurance schemes for promotion of activities by SHGs, cooperatives, farmers, companies, especially for processing, grading, storage and primary value addition will encourage small holder farmers in out-scaling their innovations, since, such provisions will reduce risk factor and build much needed self confidence to promote farm innovations. Farm innovations in livestock and other high value products are, rather, less documented and outscaled. There are many innovations relating to low cost medicinal and nutritional products in livestock sector. These need verification, improvement and outscaling. There is also a great need to provide adequate visibility to protection of farmers’ innovations and sharing of benefits from their commercialization. These should go beyond plant varieties. 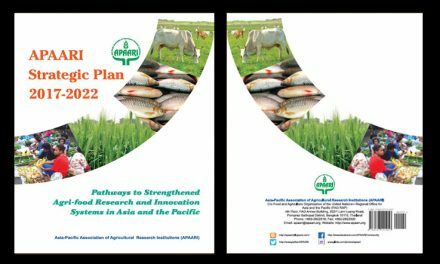 Special programs must be supported to promote innovations in on-site conservation of genetic resources.